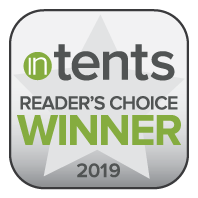 InTents magazine, the official publication of the Tent Rental Division of the Industrial Fabrics Association International (IFAI), conducts its Reader’s Choice Award annually, asking its readers to vote for the best of the best in 15 categories, ranging from Best Tent Manufacturer to Best Rental Software. Herculite offers a full line of tent and structure fabrics under its Architent brand, serving tent manufacturers and tent rental companies nationwide. Herculite’s Architent brand is recognized for beautiful aesthetics as well as exceptional durability, wide range of colors and easy care under the most demanding conditions. Headquartered in Emigsville, Pennsylvania, Herculite, Inc. is an innovative company that has specialized in high performance flexible composite textiles for more than 60 years. Herculite supports a variety of performance markets, including awning, marine, healthcare, digital media, tents, structures and other technical applications. © 2019 BANTEX COLORSURE TECHNOLOGY. All Rights Reserved.